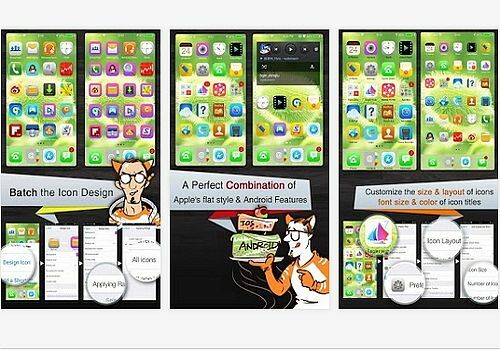 Espier Launcher 7 is an application launcher for Android with a theme very inspired by iPhone and more particularly iOS 7. It allows you to completely redesign your phone with icons with a sleek design and a flat style. This application offers fluid and eye-pleasing animations. Like any launcher, you will be able to move applications to the places of your choice or create thematic folders to store the programs of your choice. You can also resize the size of the icons or choose a new grid for displaying your applications. Highly configurable, Espier Launcher 7 has premium features for which it is necessary to go to the checkout or to accumulate Espier Coins. We will still appreciate the extensive content offered in the free version. One Launcher is an Android application that acts as a launcher. It is very light and customizable since you can add many icon packs to it to have a unique device. Control Panel is an application available on Android that allows you to give your device the same control center as the one found on iOS. You can of course customize it from the options. Floatify Lockscreen is a free application that replaces your lock screen. It offers a sleek look with the display of notifications that can be customized as desired. Poco Launcher is an Android application that acts as an application launcher. It replaces the one you have on your smartphone and opts for a simple but customizable interface according to your needs.